Affordable property prices, low taxes, simple and straight forward buying process, chance to open and run private business makes Northern Cyprus appealing to international property buyers. International citizens choose to purchase property in Cyprus for retirement, profit from rent, to open own business or simply to invest capital in overseas property market. Implementation of large-scale infrastructure projects conducted by the EU or Turkey, as well as opening of new international schools, universities, chain restaurants, hotels, and shops give strong push to attract students, tourists and property buyers each year. The cost of one square meter of the North Cyprus property varies from under 500 pounds per square meter to 1000 pounds, and sometimes higher for truly exclusive offers on the property market. Especially popular among some property buyers is housing with convenient payments plans, such as credit plans or installment payments. The construction companies rather than banks provide the payment plans, which makes the process easy and comfortable. In addition, buyers will not need to provide extra paper work, bank statements or salary reports, for all is needed to buy a property in North Cyprus is valid passport. During the past few years, interest from international buyers increased for resale property in North Cyprus. Resale apartments and villas are often can be bought 20% cheaper than newly built housing. However not only the price attracts buyers to choose resale property rather than newly built. Often, factors like ready title deeds, paid VATs, connected water and electricity meters make buyers more inclined toward resale properties. 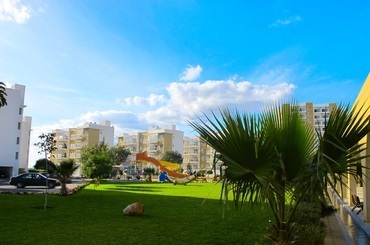 However, the resale market is only available in Kyrenia region, on the north coast, while regions like Famagusta offer primarily newly built apartments, villas, and large residential complexes. Legislation of Northern Cyprus restricts foreign nationals (one person or family) to buying certain amount of land, and ownership of one title deed to a property. There are no other limitations that concern property in Northern Cyprus and every foreigner has complete freedom in choosing property in Cyprus whether it is studio apartment or luxury sea front villa. Those investors who wish to purchase more than one object or property located on a larger area than 1338 square meters (one donum of land), have the right to establish real estate company, or sign the properties to a trust company.